But unlike other wines down the ages, Fondillón’s journey was not done. Nor has it been reduced to a quaint curiosity with little to offer the contemporary wine drinker. The February 2008 issue of the “Wine Advocate” gave a 93-point rating to Primitivo Quiles Fondillón Gran Reserva Solera 1948. There are other peculiarities relating to Fondillón. The two leading producers from the town of Monovar, Bodegas Salvador Poveda and Bodegas Primitivo Quiles, make oustanding Fondillons. 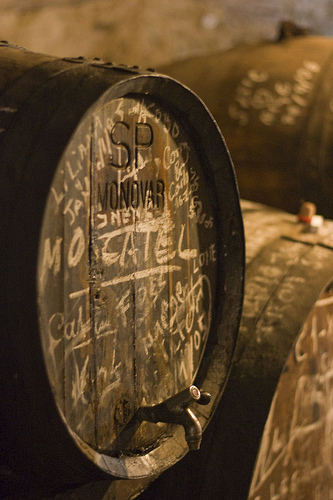 But the Quiles Fondillón is made using a sherry-style “solera” system blending younger wine with older casks of wine, while the Poveda Fondillón is made from specific vintages as with Port. These two houses are responsible for saving Fondillón for posterity. Sales volumes cannot provide an exciting commercial return, but this piece of living history is central to the identity of these bodegas and this area. Other Alicante producers have begun to make their own Fondillons. These are all similar in style to the two mentioned, other than Fondillón Casta Diva Solera 1978 from Gutiérrez de la Vega, which is an intense ruby red and far sweeter (also lighter in alcohol at 14% ABV), in reflection of the winemaker’s different take on the historic style (also rated at over 90 points by “Wine Advocate” and at 88 by “Wine Spectator”). It is also sold at over 100 euros a bottle, while the others generally come in at twenty-something, though Salvador Poveda earlier this year launched a new blended Fondillón – “Sacristía” – combining wines from various vintages between 1930 and 1980, with premium packaging and price. This old fellow with the amazing stories of royal patronage, and helping fend off scurvy on sea voyages before the use of limes, is picking up a few new tricks. Here’s wishing this particular Ancient Mariner a long life ahead with many more tales to be told and no more albatrosses around his neck.